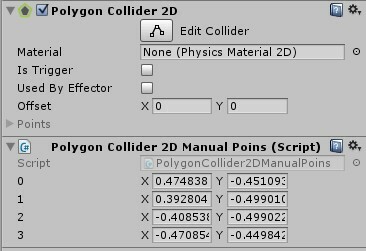 Manually edit Unity3D collider coordinates? Trying to create a 2D game where I need a 2D polygon collider with exact symmetry, so I'd like to set the coordinates by hand/numerically, rather than using a mouse. I suppose the game could adjust the coordinates at start-up, but I'd prefer to have them correct "design time", if possible. Also, if I'm to do it programmatically at start-up, I'd appreciate a how-to or suitable link to help on that. For Unity 5 you can use this workaround. Place script below to the Editor folder. I solve this by creating other script to be added with PolygonCollider2D. This extra script that edit polygon points. So, it's a script to edit other and "Edit Collider" button stay. Not the answer you're looking for? 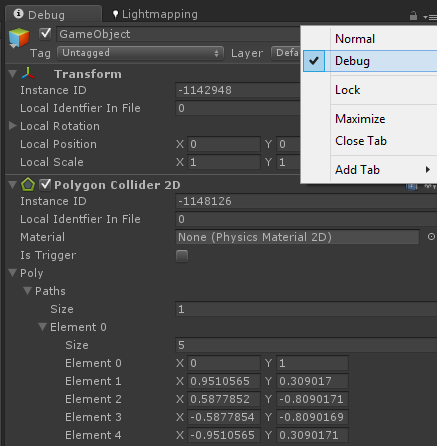 Browse other questions tagged unity3d collision-detection unity3d-2dtools or ask your own question.